What would a nuclear physicist do, if presented with an apple? Isaac Newton is said to have discovered gravity upon seeing an apple falling from a tree. 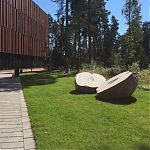 A sculptural installation stands outside the VTT Technical Research Centre of Finland’s Centre for Nuclear Safety. 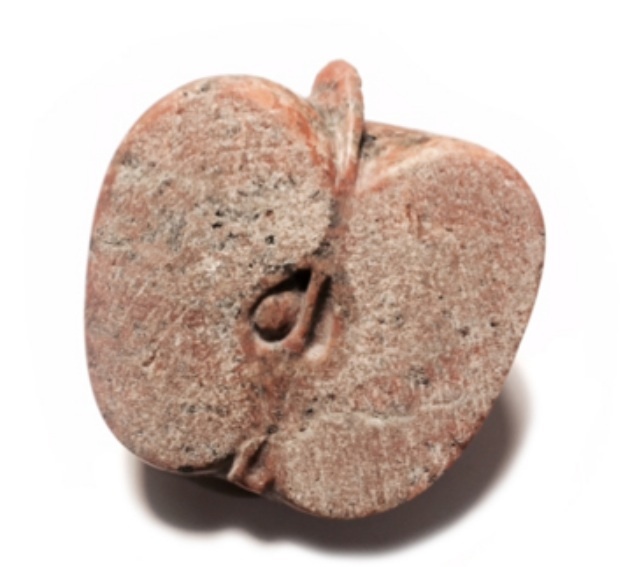 It features apples, hewn from stone, that seem to have appeared from nowhere. The biggest of them is cut in half. 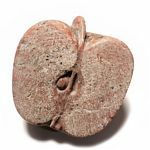 The single apple found inside the building foyer has a hole running across its diameter, through which a split apple outside can be glimpsed. Nuclear fission is a process during which the atom splits as it is hit by a neutron. The nucleus breaks up into lighter nuclei, releasing energy and neutrons. Representing this reaction as a straightforward equation would be impossible, even if you wrote it in stone. 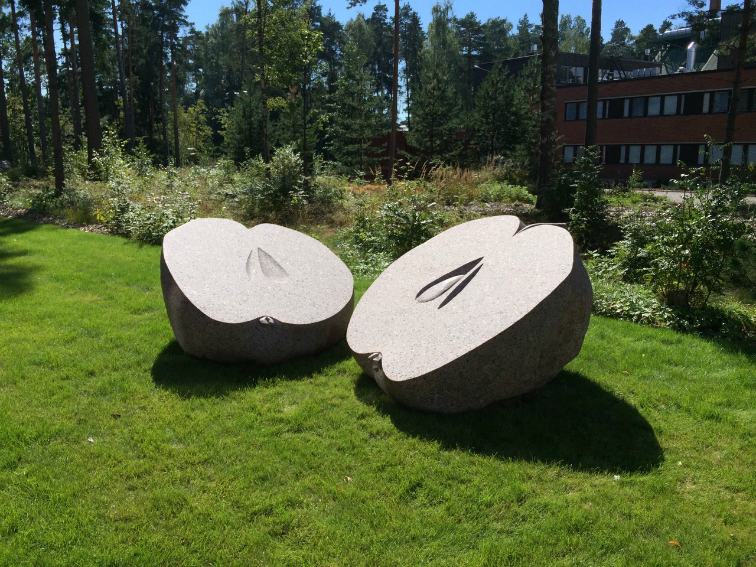 The apples at the VTT Centre for Nuclear Safety are cut from stone that was once carried and put to the test by the awesome forces of a continental glacier. 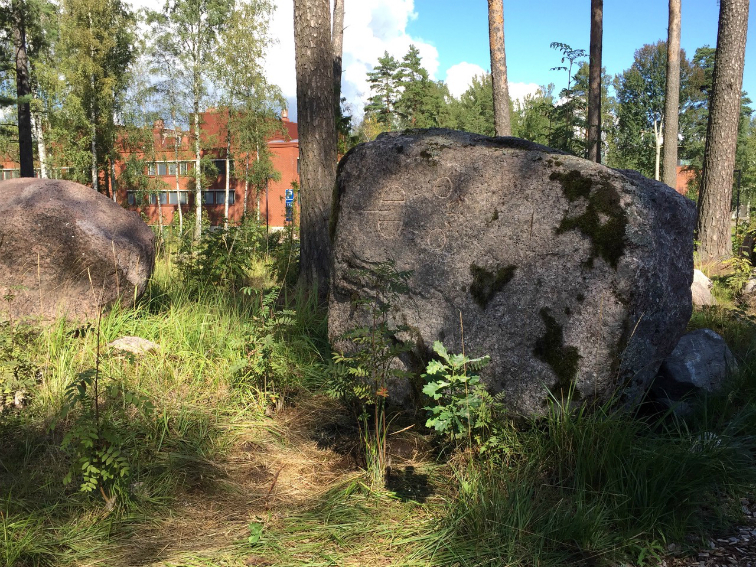 Only the most solid pieces of the bedrock remained, losing their edges as the ice swept over them, turning them into the glacial erratics and other rocks now found in the local environment. They serve as reminders of the hundreds of millions of years that have passed before our time, along with the ice ages that have been and the ice ages that are perhaps still to come. It is fascinating to consider the significance the nuclear safety research being pursued today will have in future. 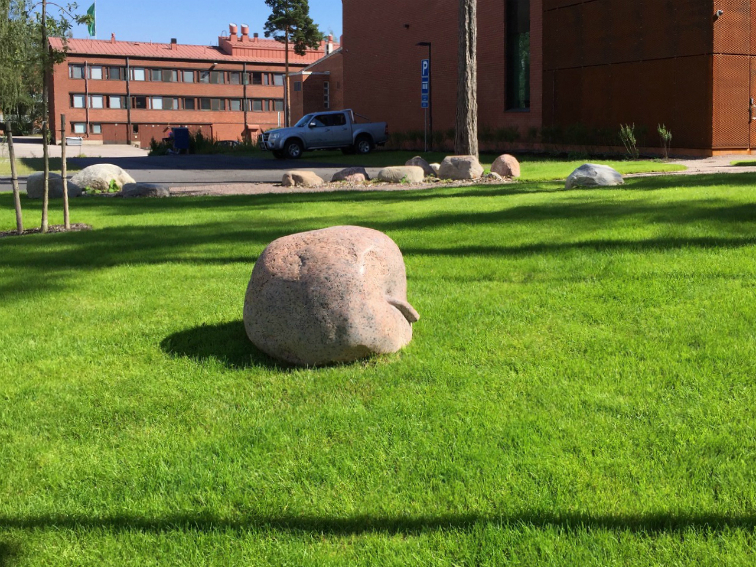 What meanings will these stone sculptures hold years from now? 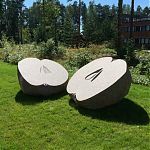 In October 2013, the Finnish State Art Commission declared a competition for six invited artists for a work of art for the courtyard area of the VTT Centre for Nuclear Safety. 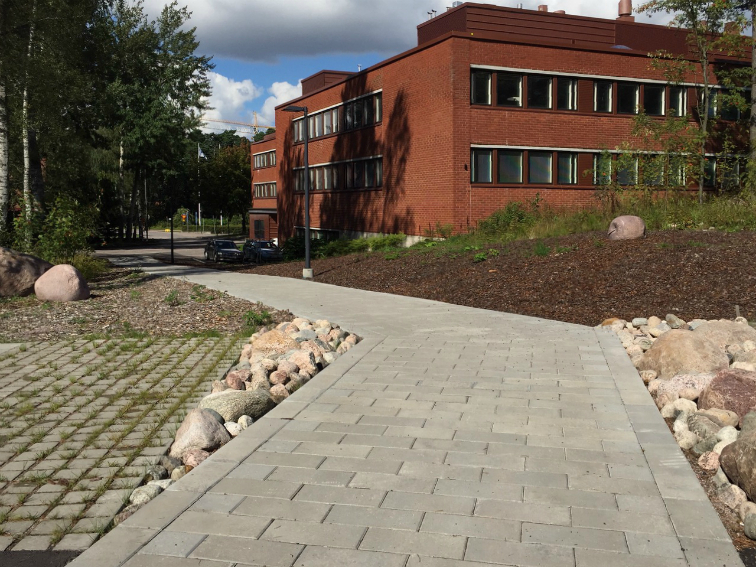 Designed by SARC Architects, the building will be completed in Otaniemi in 2016. The invited artists were Lauri Astala, Tommi Grönlund and Petteri Nisunen, Timo Heino, Michael Johansson, Marja Kanervo and Anne Koskinen. Second place went to Michael Johansson for Real Life Tetris, with its ”idea is presented familiar, everyday objects in a new and unexpected way.” “The themes of recycling and consumption give the work a connection with the everyday lives of people, thus making it accessible.” Third place was awarded to Lauri Astala for his entry Background Radiation. 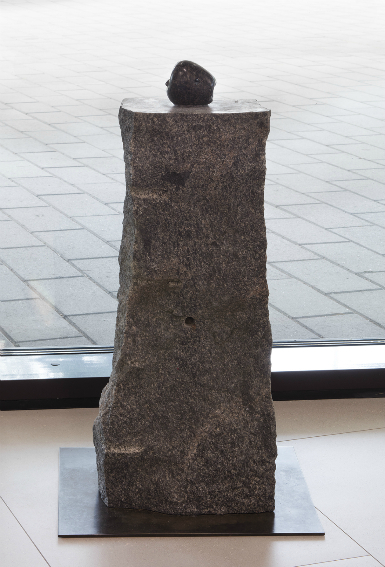 This entry proceeds from expressing the nuclear safety context of the building with the visualization of a concrete natural phenomenon, radioactive radiation in nature, with a work of art that is as immaterial as possible. 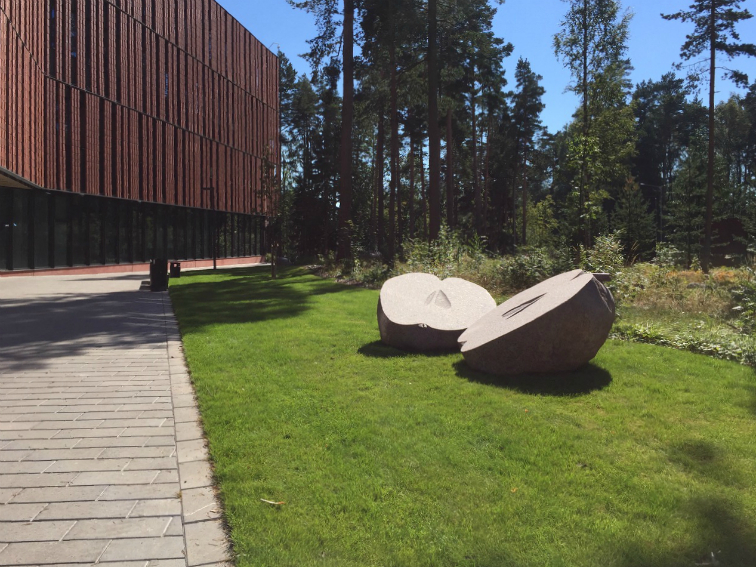 The entries are on display at VTT Digital House, Vuorimiehentie 3, Otaniemi Mon. – Fri. from 9 a.m. to 4 p.m. from 19 to 26 March 2014. The work continues the story of Newton’s Apple suggesting that a nuclear physicist, instead of seeing an apple fall, would rather be interested in splitting an apple. 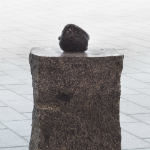 The work consists of 9 granite sculptures placed as shown in the site plan. 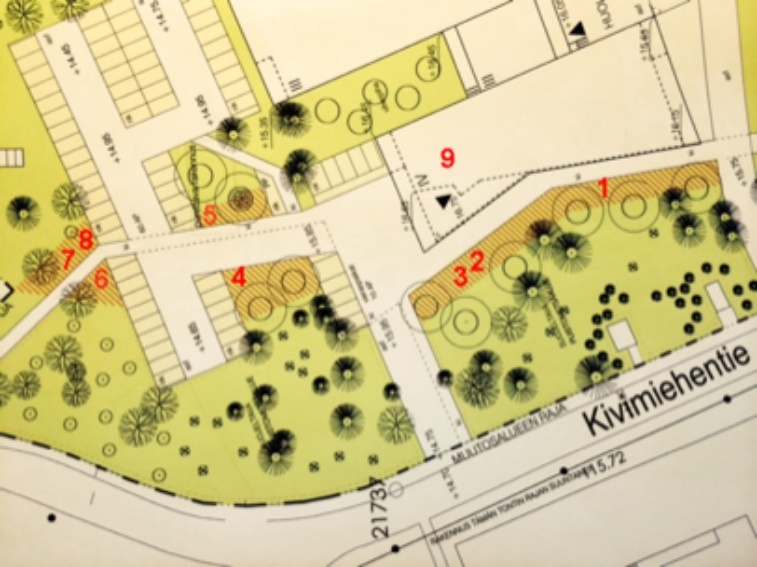 When walking from south to north (in the site plan from right to left) even an amateur can understand the principle of nuclear fission as the sculptures can be read as metaphors for neutrons, atoms and isotopes. Ydinfyysikon omena lähestyy ydintutkimusta omenan halkaisemisen kautta. Omenan siksi, että omena liittyy olennaisesti fysiikan tutkimuksen historiaan. Uskotaanhan Isaac Newtonin keksineen painovomalain nähdessään omenan putoavan. Tätä kertomusta ehdotus jatkaa. Ajatuksena on, että omenan putoamisen sijaan ydinfyysikon kiinnostus kohdistuu omenan ytimeen. 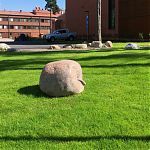 Kokonaisuus koostuu graniitista valmistetuista suurikokoisista omenoita esittävistä veistoksista. Suurimmat omenoista on halkaistu. Näin niistä paljastuu nähtäväksi ydin. Teoksen äärellä voi amatöörillekin selittää fission periaatteen. 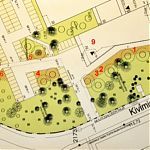 Kuljettaessa etelästä pohjoiseen (kartassa oikealta vasemmalle) kulkijalle avautuu kertomus fissiosta, jossa neutroni 1 (pieni omena) osuu halkeavaan ytimeen 2 ja 3 (halkeava omena kahdesta osasta). 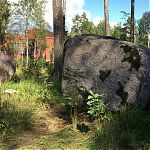 Parkkipaikan yhteyteen sijoitetut veistokset 4 ja 5 (omenan puolikkaat) on sijoitettu tien kummallekin puolelle, ne kuvaavat syntyneitä isotooppeja. Viimeiseksi pienet veistokset 6, 7 ja 8 (pienet omenat) kuvaavat vapautuneita neutroneja. Neutroneiksi voi tulkita myös omenan siemenet. 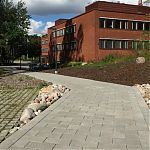 Lisäksi aulaan sijoitetaan veistos 9, jonka voi ajatella olevan niin prosessin aloittava neutroni kuin atomiydinkin. Lisätietoa suomeksi Valtion taideteostoimikunnan sivuilta.